The thought of forcing down a meal created in a fondue pot is quite revolting to me but Dylan's Candy Bar has taken the idea & given it an appealing twist. 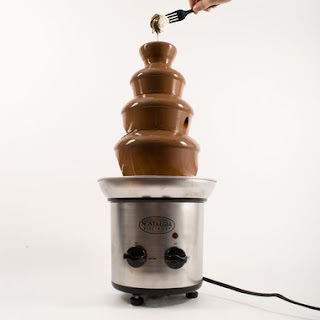 Meet the Chocolate Fondue Fountain. Forget sickly melted cheese goo....this chocolate trickler is just like the contraption used at office parties everywhere - only smaller! I've attended too many parties to mention where the food highlight for many (hmmmm.... don't get out much?) was the unveiling of the iconic chocolate fountain. People go mad for this thing... so for Dylan's to unleash a tinier, home appropriate version, well, I'm sure they've made many a holiday more fun...more delish! It's kinda cheap too.... less than $80 US, so this thing is appealing for lots of reasons!